Healthcare management is a broad field serving one of the largest and most essential industry segments in the U.S. and Canada. Management is needed in the multiple aspects of the industry which include: hospitals, nursing homes, physician’s offices, pharmaceutical and device manufacturers, consulting, government and public policy, and many more. Healthcare management as a profession was recognized more than 50 years ago. Even then, the industry was complex. Leaders and administrators required a level of expertise and skills not normally attained at the undergraduate level. From the first CAHME accredited graduate program founded in 1932 until now, the master's degree is recognized as the essential first step toward an executive and managerial career in most healthcare organizations. 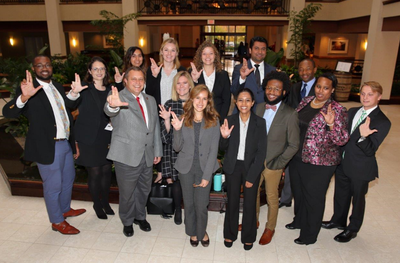 The UofL Department of Health Management & Systems Sciences (HMSS) recognizes the need to train and further educate a broad cadre of skilled leaders and managers to meet immediate and critical organizational and system-wide challenges, especially as major policy reforms propel widespread disruption across the entire healthcare delivery system. Because healthcare management is an information-intensive, team-based field that adopts any technology that helps get the job done, all required courses and required supporting courses (“selectives”) include the use of data, information, team-based learning techniques, research methods, or technology, most more than one of these and many all four. >> UofL's location within a large metropolitan healthcare industry center makes opportunities plentiful for our students, including employment. >> The MSHA program uses UofL’s Population Health Leadership (PHL) Competency Model, a modified version of the National Center for Healthcare Leadership (NCHL) competency model. >> All of the MSHA courses draw from real world projects gathered from the local healthcare industry. >> The practicum is designed to expose students new to the health management field to working conditions in healthcare organizations between their first and second year in the program. >> The culminating capstone course is an applied management experience in the healthcare industry. Students assist organizations in solving real-world and real-time problems using critical-thinking and problem-solving skills gained in the curriculum. >> Projects throughout the program are linked to the healthcare industry, practicing managers, SPHIS faculty, and graduate students. Students participate in research projects via multiple research centers housed within SPHIS and expect that these projects could lead to authorship opportunities in peer-reviewed journals. >> The UofL MSHA is in “candidacy” status with the Commission on Accreditation of Healthcare Management Education (CAHME). CAHME is the accrediting body for graduate programs in health management in the US. Our MSHA is designed to be completed in two years. Full-time and part-time options are available. MSHA courses are offered on our Health Sciences Center campus in downtown Louisville. MSHA graduates are prepared to enter a variety of management positions within healthcare where they can focus on the delivery, quality, and cost of healthcare for individuals and the population. With the MSHA evening track, students can work as full-time employees and attend classes after 4:00pm, primarily Monday through Thursday with an occasional Friday class. This strategy allows students who have little work experience, gain healthcare-related experience that can be listed on their resumes, thus making them more competitive for fellowships, internships, or employment opportunities post-graduation. MSHA students are required to complete a practicum experience (normally during the summer semester). The practicum is designed to expose students new to the health management field to working conditions in healthcare organizations between their first and second year. Students must successfully complete the 57-credit hour curriculum, earn a passing grade in the MSHA Capstone Course, and have an overall 3.0 GPA in coursework in order to graduate from the program. Review the course sequence for the MSHA. The program flyer for the MSHA is another useful resource. For more information about the MSHA, check out the MSHA Program Curriculum.